I used to write one of the top 5 nationally ranked real estate blogs. An article I wrote on this blog is the theme of this post, as well as the title. Many years ago I was in attendance at a real estate industry, Inman News “Connect” Conference, when the Zillow team with great fan fare announced their presence. To the internet world, Zillow was an instant hit. Their founding CEO had made a big name for himself in the online world by disintermediating the travel industry, basically terminating the need for most of the travel agencies. This new .com took off like a rocket as many people, buyers and sellers thought it might be cool to eliminate real estate agent fees. Not many months later I published an article with this title: “If You Are Going To Use Zillow You Better Hire Zorro.” This tongue in cheek article was based on a couple of issues I was experiencing that the new Zillow was creating in the marketplace. It made me famous. KING 5 TV soon called and wanted to interview me for the evening news. I thought, “how cool”. The point of the article was that Zillow’s algorithm was way off and people, mostly buyers, were using Zillow to determine what they felt they should offer for a home. I did make the evening news, as did founder Rich Barton, who admitted on the show that they could be off by as much as 7% up or down. Seven per cent high or low meant that really they could be 14% off. I don’t know the formula for their computing values, but at the time, and probably now, it includes the details available in the County assessor sales records. So, if you are looking at a home on the market for $300,000 and Zillow was off by 7%, that is a $21,000 disparity. Frustrated with sellers contacting me and telling me my listings were over priced I began to become frustrated with the holy Zestimate. Buyer after buyer challenged the listing price, not only of my listings but many that were on the market. Here is the text from Zillow.com regarding their zestimate®: The Zestimate® home value is Zillow’s estimated market value for an individual home and is calculated for about 100 million homes nationwide. It is a starting point in determining a home’s value and is not an official appraisal. The Zestimate® is automatically computed three times per week based on millions of public and user-submitted data points. In many markets the County Records are an obvious important data source. In my old market, King County, Washington, every transaction had to be recorded with an actual sales price. Each sale had a significant sales tax and the County wasn’t about to lose that revenue. One could not overlook recording the sale and sales price. Zillow had access to those records. It is reasonable that over time a Zillow could create a pretty reasonable estimate of what neighboring homes were creating as value. Of course some important variables are missed this way, but as time went on and recordings were published, it cold be better for those interested. As mentioned, I do not have privy to their formulae. It has to be significant to have the local MLS data. Herein lies what prompts me to revisit, “If you are going to use Zillow you better hire Zorro”. Two important obvious data points are at play in Utah, and perhaps in other markets. The first is that Utah is a non disclosure State. In other words when a sale is recorded at County level the sales price is not disclosed. I don’t agree with the policy, it makes it difficult for appraisers, and therefore borrowers and sellers, if they cannot obtain the sales prices of comparable properties. So what one might say, they have access to the MLS records. That isn’t always the case. For example, in Canyon Road Towers and Terrace Falls condominiums much of the sales were consummated by agents with a Utah License, but they are not members of the MLS. The quantity of these unrecorded non MLS sales has dropped significantly in Canyon Road Towers since I became licensed in Utah. A couple of years ago I came across an appraiser in Canyon Road Towers. I asked him how he could comp the building. I knew of sales that weren’t public. He couldn’t use them so he had to do what was in fact a faulty appraisal. He had no choice as he had no information. I told him I knew some of the buyers and could possibly obtain a settlement closing statement for him. He declined, he couldn’t use them. So, in Utah, Zillow has less information to work with, important information. OK, so they have MLS info and that is important, right? Now we come to the point that triggered me revisiting this topic. I recently closed on selling a condo to a savvy person moving to Salt Lake City from Washington DC. She shared with me her frustration that listings she wanted to see were in the MLS, including on my website, but not on Zillow. It seemed to bother her. There is a reason for this fact. Some MLS’s, including ours, have decided it is the right or responsibility of the agent or brokerage that secured the listing to allow the data to be published on Zillow. Actually Zillow, Trulia, or any site other than http://UtahRealEstate.com/ or their member agent sites like mine. Instead of a listing being automatically uploaded it is optional. This is why my client wasn’t finding listings she was interested in on Zillow. Herein lies a moral debate. On one hand does a listing agent owe the seller or buyer an obligation to market their listings on these sites. Zillow has purchased Trulia and more informational websites). On the other hand, the agents are giving these sites the ability to use their hard work and make billions. They may sell things as a lead, or advertise paying agents alongside their publication of the listing. Trulia was purchased for Billions. Having this data is worth billions, but not to the listing agent. According to Brad Inman of Inman news it is now checkmate for agents with this Zillow Trulia acquisition. Checkmate in that agents are going to have to pay through the nose for leads that come off of Zillow/Trulia. The claim here is that too many of the consumers will come first to these sites and then in fact, in a way, the agent is truly disintermediated as were the travel agencies. The difference here is that the savings to consumers is unlikely. Typically the lead cost will be a significant new cost the real estate professionals will or do incur as a cost of doing business. Rare will there be a savings to the consumer. Also, it isn’t necessarily a fact that the consumer will be sold as a lead to a competent agent. It his he or she agent who needs to or is willing to pay to play that is connected to the customer. Whichever stance you take, that these sites are pilfering from the real work of the professional that did the grunt work, or that the dotcoms or their site visitors have the right to expect free access to the data on these sites, the fact now remains that all of the data is not published on all websites. In Utah and other States the only place to find all of the listings for sale is on the MLS sites. It’s a fact, that it is now optional to submit listings to other non MLS websites, and that real estate agents can choose to contribute to “checkmate” or not. What led to my clients frustration is many are saying that they won’t submit to aiding and abetting their financial intermediation, or checkmate, by not publishing them. To her, too often, the listing that she wanted to see on Zillow just wasn’t there. By the way, being famous on TV was not so fun. The interview started off friendly and again I thought that this was cool. The interview then took a sudden turn. The reporter was a young guy who loved the idea of Zillow. I wasn’t prepared as he was. I found myself not such a great interview and I was beginning to hope no one I knew watched the news that night. Wrong again, I received a lot of, “hey I saw you on TV last night”. It turned out that perhaps I was the one who should have hired Zorro. 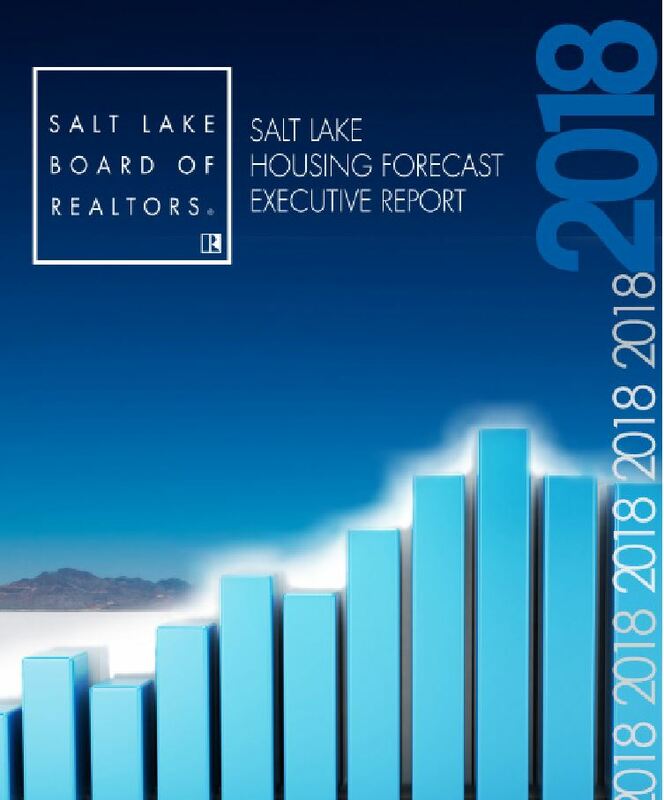 2018 Salt Lake County Residential Real Estate Market Last Year Was the Fourth Best Year in Overall Home Sales and Biggest Year Ever for Multifamily Sales. By James Wood Ivory-Boyer Senior Fellow, Kem C. Garder Policy Institute, University of Utah Commissioned by the Salt Lake Board of Realtors ® Salt Lake County’s residential real estate market benefited from another year of strong demographic and economic growth and very favorable mortgage rates. For the sixth consecutive year the average mortgage rate was below 4 percent. Recap of 2017 A year-end snapshot of Salt Lake County’s real estate market compared to 2016 shows:® Single-Family Sales • 13,293 single-family homes sold, a slight decline of 3 percent. • The median sales price of a single-family home at $325,000, up 10 percent. • The value of single-family sales at $4.9 billion, an increase of 8 percent. Multifamily Sales: (Condominium, Town Home and Twin Homes) • 4,500 multifamily units sold, up 4 percent. Biggest year ever in multifamily sales. • Median sales price of multifamily unit at $225,000, up 11 percent. • For the first time multifamily sales exceeded $1 billion dollars. Salt Lake City, West Jordan and Sandy are the Top 3 Cities for Highest Home Sales The combined sales in 2017 of single-family and multifamily homes in Salt Lake County totaled 17,804 units, the third highest year ever. Only during the two years preceding the Great Recession (2005-2006) and 2016 were residential sales higher Figure 1. Salt Lake City captured by far the largest share of residential sales activity with nearly a 25 percent share; a total of 4,213 homes, far ahead of other top ranked cities. The next four highest ranked cities in number of home sales were: West Jordan (1,796 homes), Sandy (1,617 homes), West Valley (1,499 homes) and South Jordan (1,437 homes). The Median Income Can Still Afford 65% of the Homes Sold in Salt Lake County The median sales price of a single-family home in Salt Lake County increased by 10 percent in 2017, marking the sixth consecutive year of price increases Figure 2. Since 2011, the median sales price in Salt Lake County has increased by 50 percent, moving up from $216,431 to $325,000. Housing price increases in the county rank among the highest in the U.S.
CLICKING HERE CAN TAKE YOU TO THE FULL FORECAST WITH CHARTS.